I love scrapping pages with just one photo but often the story I want to tell requires multiple photos. Grouping them all together like on this page creates a sense of balance so the photos are not too overwhelming and yet still leaves room to add some patterned paper and simple embellishments. 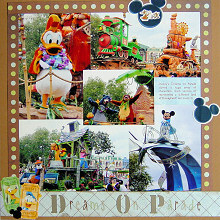 This layout was created using Scenic Route Newport Chestnut Dots Paper, brown Bazzill cardstock, blue cardstock, alphabet rub-ons and stickers, Mickey ear stickers (these can be replaced with circles or flowers), brown ink, sandpaper (or something similar) and Mickey & Friends Ticket Stubs stickers. Use brown Bazzill cardstock for the background. Arrange your your photos in a square, as shown in the layout above (I have use two horizontal 4x6s, two vertical 4x6s and a horizontal 3x4). Make sure you leave enough room at the bottom of the page for the title. When you are happy with yr positioning, adhere. Cut a small rectangle of blue cardstock and add your journaling. Adhere on top of one of your photos in a space you don't mind covering up. Cut three strips of Scenic Route Newport Chestnut Dots Paper, each measuring approximately 1.5cm by 28cm. Ink the edges with brown ink. Adhere one strip down the left side of your page approximately 1.2cm from the edge. It should slightly overlap your photos. Repeat for the right side of your page. Adhere the final strip across the top of the page, approximately 0.5cm from the top edge. Cut a strip from the underside of Scenic Route Newport Chestnut Dots Paper measuring approximately 3.5cm by 30.5cm. Ink the edges with brown ink. Adhere across the bottom of your page, approximately 0.5cm from the bottom edge. Select two vertical stickers from Mickey & Friends Ticket Stubs stickers. Scratch the surface of the stickers with sandpaper or something similar to give a warn effect. Adhere in the bottom left corner of your page, as shown in the layout above. Add a Mickey ear sticker, flower or circle to embellish. Using alphabet stickers or run-ons, add your title across the bottom of your page, as shown in the layout above. Finally, embellish with our Mickey ear stickers, circles or flowers, as shown in the layout above.